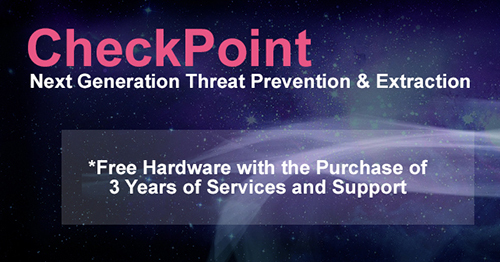 The Check Point 5600 appliance combines the most comprehensive security protections to safeguard your mid-size enterprise. The 5600 is a 1U appliance with one I/O expansion slot for higher port capacity, redundant fans and a redundant power supply option, a 500 GB hard disk, and optional Lights-Out Management (LOM) for remote management. This powerful security appliance is optimized to deliver real-world threat prevention to secure your critical assets and environments. The rapid growth of malware, growing attacker sophistication and the rise of new unknown zero-day threats require a different approach to keep enterprise networks and data secure. Check Point delivers fully integrated, comprehensive Threat Prevention with award-winning SandBlast™ Threat Emulation and Threat Extraction for complete protection against the most sophisticated threats and zero-day vulnerabilities. Up to 18x1GbE ports or 4x10GbE ports. The 5000 appliances are built to protect branch offices to midsize enterprises from both known and unknown threats with antivirus, anti-bot, SandBlast Threat Emulation (Sandboxing), and SandBlast Threat Extraction technologies. As part of the Check Point SandBlast Zero-Day Protection solution, the cloud-based Threat Emulation engine detects malware at the exploit phase, even before hackers can apply evasion techniques attempting to bypass the sandbox. Files are quickly quarantined and inspected, running in a virtual sandbox to discover malicious behavior before it enters your network. This innovative solution combines cloud-based, CPU-level inspection and OS-level sandboxing to prevent infection from the most dangerous exploits and zero-day and targeted attacks. In addition, SandBlast Threat Extraction removes exploitable content, including active content and embedded objects, reconstructs files to eliminate potential threats, and promptly delivers sanitized content to users to maintain business flow. Customers with high connection capacity requirements can purchase the affordable High-Performance package. This includes the appliance plus one interface card with transceivers and Lights-Out-Management. High-speed connectivity is essential to meeting the needs of today’s enterprise networks. That’s why the 5000 appliances are built to provide maximum port density and flexible connectivity in a compact, single rack unit form factor, including support for 4x1GbE, 4x10GbE (5600 and 5800) as well as 2x40GbE (5800). An optional LOM card provides out-of-band remote management to diagnose, start, restart, and manage the appliance from a remote location. Administrators can also use the LOM web interface to remotely install an OS image from an ISO file. The Check Point 5000 appliances deliver business continuity and serviceability through optional features such as hot swappable redundant power supplies as well as advanced Lights-Out-Management (LOM) for out-of-band management. In combination, these features ensure a greater degree of business continuity and serviceability for customer networks. Every Check Point appliance can be managed either locally via its available integrated security management or centrally via unified management. An intuitive, web-based administration interface provides local management of up to two 5000 appliances for high-availability deployments. Dimensions (standard wxdxh) 17.24 x 16.01 x 1.73 in. 17.24 x 16.01 x 1.73 in. 17.24 x 20 x 1.73 in. 17.24 x 20 x 1.73 in. 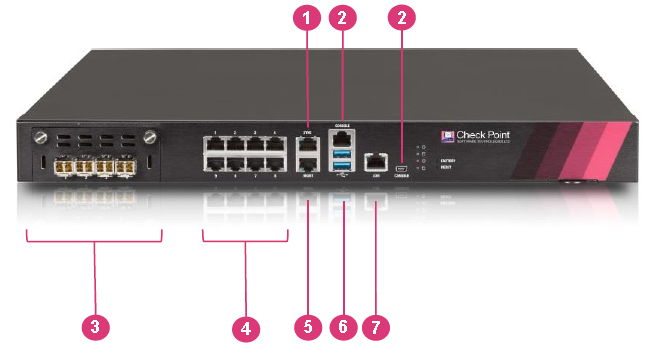 Download the Check Point 5600 Appliance Datasheet (PDF).